Immunosuppressant. 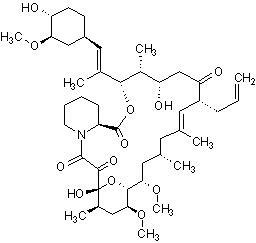 Complexes with FKBP-12 to inhibit calcineurin. Our Abpromise guarantee covers the use of ab120223 in the following tested applications. ab32518 staining IkBα/β in RAW 264.7 cells treated with FK506 (ab120223), by ICC/IF. Decrease in IkBα/β expression correlates with increased concentration of FK506, as described in literature. The cells were incubated at 37°C for 3h in media containing different concentrations of ab120223 (FK506) in DMSO, fixed with 100% methanol for 5 minutes at -20°C and blocked with PBS containing 10% goat serum, 0.3 M glycine, 1% BSA and 0.1% tween for 2h at room temperature. 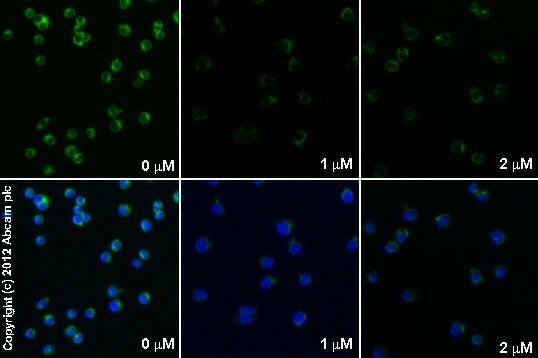 Staining of the treated cells with ab32518 (1/100 dilution) was performed overnight at 4°C in PBS containing 1% BSA and 0.1% tween. A DyLight 488 goat anti-rabbit polyclonal antibody (ab96899) at 1/250 dilution was used as the secondary antibody. Nuclei were counterstained with DAPI and are shown in blue. Est-ce que ab120223 est soluble dans de l'eau? J’ai regardé dans la littérature et FK506 n’est malheureusement pas soluble dans l’eau. FK506 est soluble dans des solvants organiques par exemple : Méthanol, Éthanol, Acétone, Éthyle Acétate, Diméthyle éther, Chloroforme, Dichlorométhane. FK506 est peu soluble dans des solvants aqueux. Si vous devez le solubiliser de cette façon, je vous conseille d’abord de le diluer dans de l’éthanol puis le diluer dans du PBS. La solubilité de FK506 est ˜0/.15 mg/ml dans une solution 1 :5 éthanol : PBS (pH7.2) en utilisant cette méthode. Cependant, il est recommandé de ne pas de stoker cette solution pour plus d’un jour. We tested to see if this product could be dissolved in saline, however it could not be solubilised. It is known that FK506 (Tacrolimus) is soluble to around 100 mM in ethanol. I would suggest reading through the literature as this paper has used a combination of saline, PEG40 castor oil and 2% ethanol to use FK506: https://www.ncbi.nlm.nih.gov/pubmed/28083805 I hope this will be useful for you. If you need any further assistance in the future, please do not hesitate to contact me. 1. Has ab120223 been used in in vivo experiments in general and for the rejection of the implant especially. 2. How should ab120223 be delivered in vivo? If it is injection, what type? 3. How should ab120223 be dissolved for in vivo experiments? For how long it will be stable in this case? 4. Is ab120223 oxidized due to the exposure to oxygen (from the air). 5. Is ab120223 delivered as a powder? Do you have some way to help me with these? 1. Has ab120223 been used in in-vivo experiments in general and for the rejection of the implant especially. We have not tested in our laboratory but the same chemical has been published used for in-vivo studies. Please check the below publication and find how other people have used because we have not tested this. I have sent an email to lab and will let you know later. It will be delivered as powder.